Image: Larry Downing/Sygma/Sygma via Getty Images. Among Claire Foy’s open, political skits and jokes about Netflix’s overabundance of original content, Saturday Night Live took a moment to make a tribute with uncharacteristic gravitas. The show used the moment to say goodbye to the late President George H.W. Bush, who was frequently lampooned in SNL skits during his time at the White House. This cued up a montage of Bush impersonations by Dana Carvey, deadpanning some of Bush’s more famous lines and gesturing wildly. Carvey’s Bush is one of the defining “characters” of his career. In a response video also shown (originally aired in 1994), Bush good-naturedly pokes fun at himself, insisting the impression is “bad, it’s bad,” all the while gesturing in Carvey fashion. Not only was the tribute funny and fitting, but it also speaks to an even more remarkable backstory that exemplifies the good humor Bush was known for. In December 1992, then-President Bush had been defeated by Bill Clinton and was preparing to leave the White House. To say goodbye to his staff, or so it seemed, Bush asked everyone to report to the East Room for a Christmas greeting. Only, Bush wasn’t the person who walked into the room full of waiting staff. Instead, it was Carvey, whom Bush had secretly summoned to come roast him. Video captured by C-SPAN shows Bush and his wife, Barbara Bush, laughing and cheering along with the staff as Carvey cracked jokes at the president’s expense. 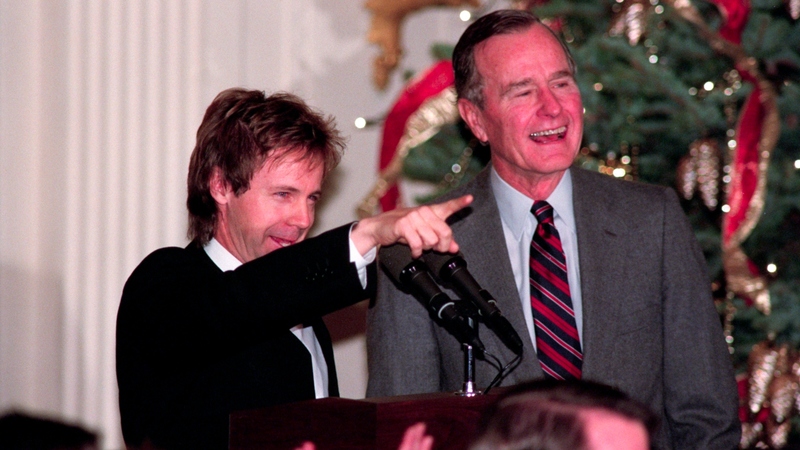 That moment led to a lifelong friendship between Bush and the comedian who once made fun of him for a living. Following the news of Bush’s death, Carvey issued a poignant statement about his unlikely pal.